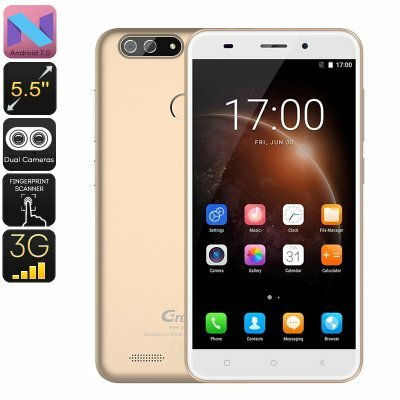 Successfully Added HK Warehouse Gretel S55 Android Phone - Fingerprint, Android 7.0, Quad-Core CPU, 5.5-Inch, 3G, Dual-Rear Camera, 2600mAh (Gold) to your Shopping Cart. With its Dual-IMEI numbers, the Gretel S55 Android phone treats you to great connectivity. By letting you stay connected to two network providers at the same time, this Android smartphone makes sure that you can always be reached on two different phone numbers. This makes the cell phone great for separating work and private life in one device. It furthermore brings along great efficiency for when you are traveling abroad. From now on, you can slide in a foreign SIM card while simultaneously staying reachable on your own domestic phone number. Thanks to this, your Android phone makes sure that you’ll always be within reach for friends and family. This cheap Android phone comes packed with a Quad-Core processor. This CPU has been clocked at 1.3GHz. It brings along enough power to tackle all basic Android features without dropping a frame. Therefore, you’ll be able to enjoy a smooth user experience while browsing the web, watching movies, and playing games. The phone comes with 16GB internal memory and a 32GB SD card slot. Thanks to this, you’ll have plenty of space to store your files and media. With 3G support and Play Store access, you can easily acquire the latest Android apps and games to keep you entertained throughout the day. Android 7.0 lets you enjoy an outstanding and lag-free experience every time you turn on your phone. On its 5.5-Inch HD display, you’ll be able to enjoy all the phone has to offer in high detail. Additionally, it supports IPS technology. Therefore, you’ll be treated to sharp and vivid images no matter your viewing angle. Thanks to its 2600mAh battery, you can use your phone throughout the day without needing to worry about running low on juice. The Gretel S55 Android Phone comes with a 12 months warranty, brought to you by the leader in electronic devices as well as wholesale Android Smartphones..